Amy: I’ve been pregnant for three of my last four Walt Disney World trips. This has allowed for really memorable ways to announce the little ones to my parents. With Audrey, I told them moments before the start of Illuminations. With the current pregnancy, I changed Audrey into a “big sister” t-shirt on the way in to dinner at Olivia’s. Chris took pictures as they realized what she was wearing. When I was pregnant with Audrey, I was sick well into the second trimester but overall it wasn’t too bad. I’m definitely not one of those people who says they ‘never feel better than when they’re pregnant.’ On those two trips in 2008, I just remember needing to take it easy which wasn’t too much of a problem since I couldn’t ride my beloved roller coasters. I take Disney’s recommendations seriously. They list in the maps and on signage which attractions should be bypassed by expectant mothers. I’ve seen online boards where people discuss which ones they rode anyway and why. Just as I won’t tell you how to raise your child, I won’t tell you how to behave while pregnant, but I don’t believe in taking chances with my babies. Sure, it might turn out fine if you ride Space Mountain, but what if it doesn’t? Is that really worth the health of your child or your own? It will be there next time, so grab a snack and relax while the rest of the group rides those thrill rides. If you use FastPass, they won’t be gone too long anyway. One day at Hollywood Studios, I played tour guide for Andy, Chris, and Cousin Jason. I had their park tickets and got them FastPasses for one thrill ride while they rode another. I also took the opportunity to take my time going through “One Man’s Dream” all by myself. All of the mountains, Rock N Roller Coaster, Tower of Terror, Test Track, Mission Space, Dinosaur, and Kilamanjaro Safaris are off-limits. I was disappointed that even the green (easy) version of Mission Space is considered unsafe. If you have any questions about whether you should ride, just talk to the cast member near the entrance. Our visit in 2010 was another story. My goal for the trip went from making it to rope drop, riding everything, and taking tons of photos to just not getting sick in the shrubs. Thankfully, Chris had gotten a new camera and took care of the photos. Walt Disney World is covered with places to get a soda and I drank far more than I normally would at home but the cold carbonation helped settle my stomach and handle the heat. I found out that you can have quite a bit of Diet Coke before you hit the caffeine limit for the day. As a former coffee junkie, my body is used to it. People who’ve known me for years may be thinking “FORMER?” This baby has made me give up coffee. Well, at least for a while. It’s creeping back into my world. My aversion to coffee was so bad that a man sat down near me with a cup on the stone benches across from Aloha Isle and I had to get up and move. At Animal Kingdom, I had to nearly run past the coffee carts on the way to Asia. In regards to those types of problems, there isn’t much you can do other than avoid what bothers you. A lot of expectant moms get nauseous if they go too long between meals/snacks. This usually isn’t much of a problem at WDW but I carried some crackers, just in case. Another lifesaver is ginger candy from Ginger People. I bought the chewy kind at Whole Foods with Audrey and I have the hard version this time, purchased from Amazon. (I have a ton. Anyone need some?) At home, I’ve found Twinings lemon and ginger tea to be soothing. Thanks to Janine, I have tried both the American and UK versions. I also wore the goofy blue Sea Bands for about a month. I'm not sure if they really worked or if they were like Dumbo's magic feather, but I thought they were worth a shot. I also need to add a big thanks to my dad for going to get me breakfast burritos which helped get the day off to a better start. Try to dress extra comfy while touring when pregnant. Our trip in late October/early November set records with 90 degree days. I admit to not being fully prepared for the heat. One day Chris and I went into “O Canada!” primarily for the air-conditioning. I do love the Martin Short version, but I watched it this day while sitting on the floor. As the week went on and the heat wave broke, I did much better. Commando touring is out the window when you’re expecting, but I see it as preparing you for the slower pace you’ll need when you come back with the kiddo. A visit with a baby/toddler/small child will be much different than trips before they came along, so consider this a practice run without the diapers and a fantastic excuse for one more Mickey bar! Corby: So, I wanted to get pregnant with baby #2 for a while. I won’t go into detail, but it ended up taking longer than I thought and I had to go through a couple of losses along the way. Finally, I became pregnant for the third time in a year and I was extremely paranoid and cautious wanting to make sure all went well. We had our November 2009 Disney vacation already booked. I was really excited because my parents were coming along with us and I knew we would have a wonderful time together as a family. I wasn’t quite sure how I would manage being pregnant and spending all day in the parks, though. I was concerned about what if something happened, what if I wasn’t feeling well, what if I was too tired and what would I do since I couldn’t go on rides? Well, it ended up, I wasn’t all that nauseous. I did feel a bit queasy and headachy at times but for the most part I was just fine. Being the huge Disney food lover that I am, I was able to enjoy that yummy Disney deliciousness perfectly fine, no aversions. As a matter of fact, I think I enjoyed it a little too much, as I gained 7 pounds during that one week of vacation! Eek! I’m sure it was all baby weight, of course…yeah right. As far as tiredness went, I ended up not having that “oh my gosh, I could fall on my face and sleep right here on the ground” feeling like I did with my first born, thankfully. We were able to go all day long in the parks as we normally do, even staying out until midnight for Mickey’s Very Merry Christmas Party one evening. I also had some of the best sleep ever when we returned back to our resort at night. The newly renovated room with queen beds at Coronado Springs was wonderful! As I mentioned, I was very concerned about the rides. I knew the obvious roller coasters: Test Track, Splash Mountain, Big Thunder Mountain Railroad, etc were out but what about the other rides? Ended up, I was able to ride quite a few. I enjoyed pretty much any ride that did not have a height requirement. One thing I was a bit surprised over was exactly how bumpy some of the “boat” rides could be when the ride was coming to an end, particularly It’s a Small World, of all rides. Mom and I were sitting next to each other, and I can remember looking at each other and gasping as we went over the bumps at the end. I quickly lifted myself up slightly as to not jar my little bean. I ended up doing this little maneuver each time bumps would come along. I’m sure I looked silly but it brought me peace of mind.  If you’re exhausted, go back to the resort during the afternoon and take a nap if needed.  If you’re nauseous, take some crackers with you to nibble on. Sprite/Ginger Ale seemed to always make me feel better so maybe sit down and enjoy a carbonated beverage.  Don’t push yourself! If you have any concerns, take it easy. 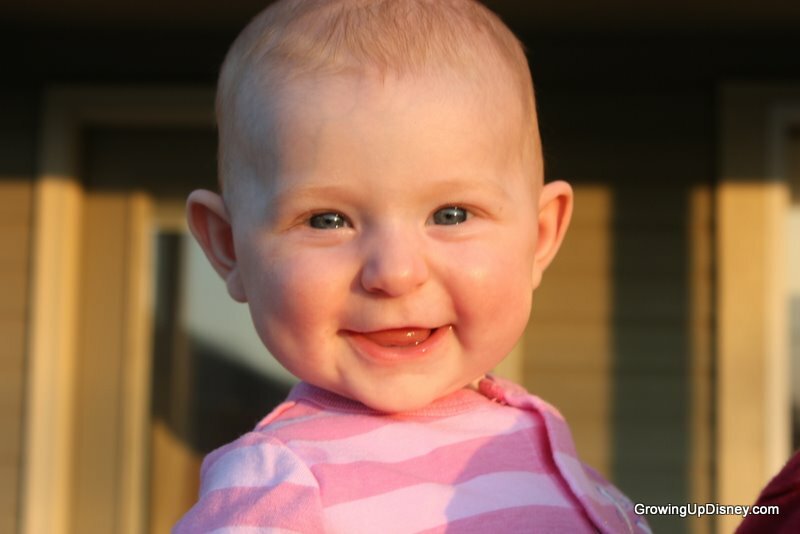 Thankfully, our little bean continued to thrive and was born May 2010. 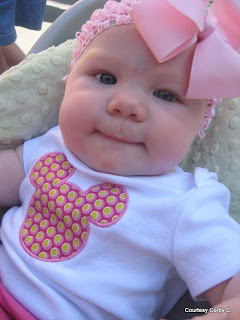 We have joked around about her first Disney trip being in utero. I just hope she’ll be a big Disney fan like the rest of our family! Thanks to our Minnie Moms for sharing such helpful tips! Check back later for part two and many more ideas. If you have a question for us or a topic you'd like us to cover, please leave a comment or email Amy. These are great tips! Hubby and I were in Disney while I was pregnant in March 2009. I was about 25 weeks and while I couldn't do the thrill rides I was really able to enjoy exploring other things while waiting for my husband to get off the rides. I found that I got a little bit of special treatment too - I was always getting free cookies and other snacks from Cast Members at the food stands. One look at my belly and I guess they just thought I needed to add to the size of it! I was 6 months pregnant for Hayley when we brought Joey (just 14 months at the time) for his first trip to WDW. Since in general I keep to the tame rides, I didn't miss much. But I was disappointed about having to miss Kilimanjaro Safaris. But, like Amy, any ride the Disney says expectant moms should avoid, I do. I had many miscarriages before having Joey and know that it is not worth it. Besides, it just meant that the next time I was there, I would get to enjoy it with my new little one. Great tips though! My top two would be stay hydrated and take it time to rest and enjoy the little things! We had our baby girl in June 2010 and suffered a loss on the way to getting our healthy pregnancy. I stayed away from Disneyland during that time for I was so afraid of losing my pregnancy I fought so hard for. I was also on progesterone injections which left me really sick. I am now ready to head back to Disneyland this November and get our season passes back as well. My daughter will be a year and a half by then and I can show her all the holiday decorations. We can't wait to go back and enjoy Disneyland with our daughter! 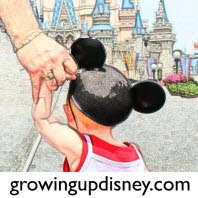 Thank you for sharing your story I really appreciate it and will read more on tips for taking small children to Disneyland it will be our first time with her. Counting down the days to November Disneyland trip!